If Halloween is not the holiday for some pretty wild creativity, I don't know what is. I’m not one for gruesome and gory scenes, but I do love using this holiday as an excuse to get a little out there with decorations and party food. Regardless, this extraterrestrial treat is sure to wow your guests this year. 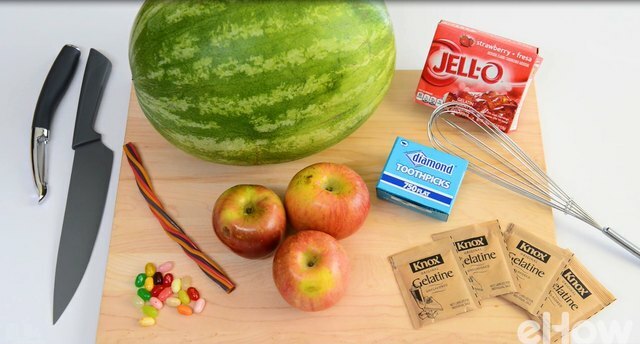 Luckily, it’s very easy to make and requires nothing more than fruit, JELL-O and some candy! 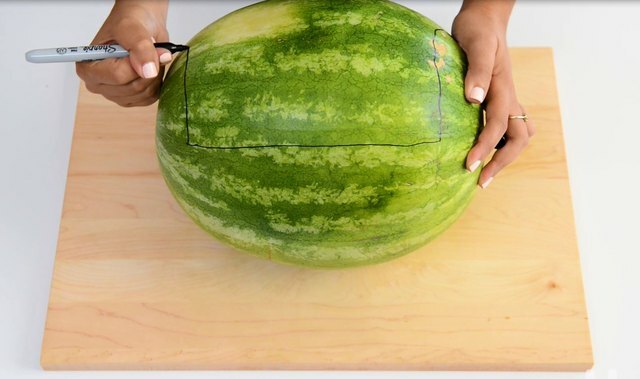 Place your watermelon on the cutting board and trace a large rectangle about two inches from the sides and about one fourth of the way down. Cut along the line at an angle and the top should come right off. 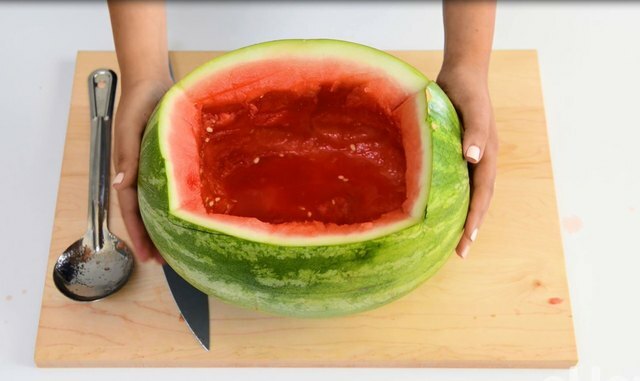 Next, scoop out the insides and hollow out the watermelon. Peel the skin off both apples. You are going to use one as the head, and the other as the body. Take the apple that will be the head and carve out two slits for the eyes, nose and mouth. Using toothpicks, take two jelly beans (either green or yellow) and push them into the slits as eyes. Take the second apple and cut it in half length-wise. 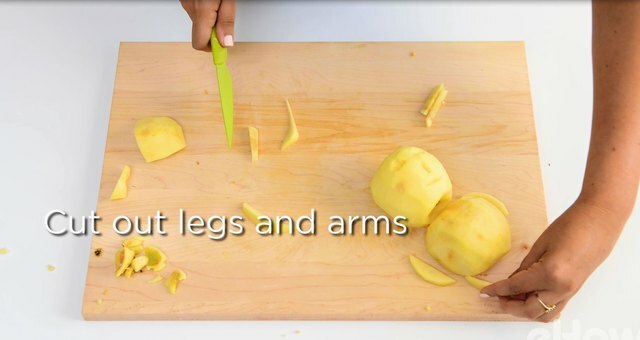 Use one half as the body, and with the other half, slice out little arms and legs. Using toothpicks, secure the limbs into the body. 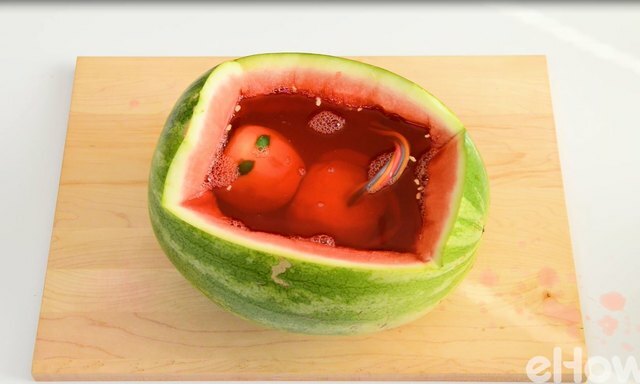 Take the head and body and place them into the hollowed out watermelon. Secure them into the bottom with, you guessed it, more toothpicks! Take a thick strand of Twizzlers and connect it using a toothpick from the belly of the apple baby into the wall of the “uterus” (a.k.a. the side of the watermelon). To fill the womb, you’ll need to separately make clear, unflavored gelatin and strawberry JELL-O. Follow the instructions on the boxes. Why even bother with the clear gelatin? 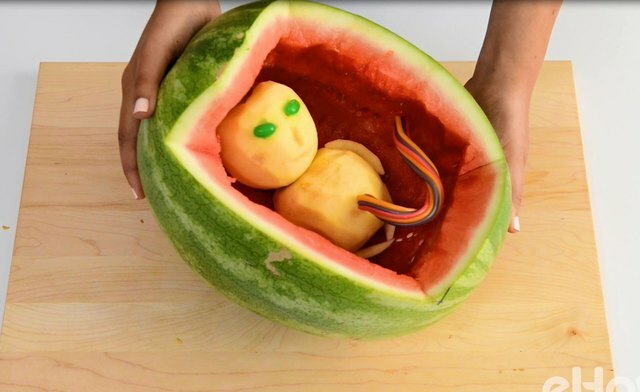 Since the inside of the watermelon is already red, adding only red JELL-O would make the opacity very dark and hard to see the apple baby inside. And we don't want that! 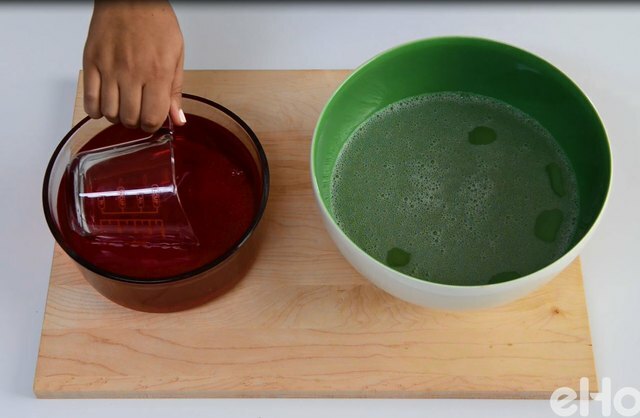 Pour some of the red gelatin mix into the unflavored, clear gelatin mix and stir together. Pour that mixture into the watermelon until it is full. Refrigerate for about 4 hours, or until the JELL-O completely sets. How adorable is your new baby? Wait, you also think I’m crazy for thinking it’s cute? Well, you aren’t the only one. If the Twizzler umbilical cord dissolved after you added the JELL-O mix, you can always add another one after the JELL-O sets. Take a toothpick and stick it into the side and slowly work in through the hardened JELL-O until the toothpick goes through the apple body. Then take the other end and add it to the inside or top of the watermelon, also securing that into the wall with a toothpick.